Within minutes of Ealing Broadway underground station, our warm and welcoming London hotel offers close proximity to popular central London attractions and Wembley Stadium. Heathrow (LHR), Stansted (STN) and Gatwick (LGW) airports are all easily accessible by tube, rail, bus and taxi. Feel valued and cared for from the moment you arrive at our friendly London – Ealing Hotel and make yourself at home in one of our spacious and comfortable guest rooms.Enjoy a light bite, afternoon tea or evening cocktails with friends, family or colleagues at The Brassiere and Bar, where you can catch up with news or sporting events on our lounge TVs. Join us for sophisticated and modern hotel dining, serving a selection of international cuisines and fine wine to suit every taste. Don’t forget to start the day right with our extensive breakfast buffet. 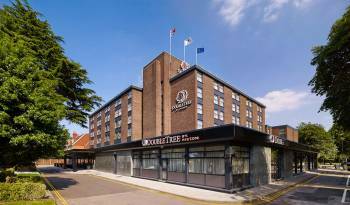 Planning an event at DoubleTree by Hilton London – Ealing is simple. Our flexible meeting space and dedicated conference space hosted by our team of experts, is the perfect place for your small meetings, dinner parties, weddings or high profile events. Meeting rooms can host a variety of events from board meetings for eight to banquets for 220 guests or 200 guests for dinner and dance. Whatever the occasion, we will ensure your event runs seamlessly from start to finish.